with Gebroeders Douwes, Amsterdam, 1920.
with Jacques Goudstikker, Amsterdam, 1923. C. Hofstede de Groot, Beschreibendes und kritisches Verzeichnis der Werke der hervorragendsten Holländischen Maler des XVII Jahrhunderts, 1908, no. 358. C. Wright, Paintings in Dutch Museums. An Index of Oil Paintings in Public Collections in The Netherlands by Artists born before 1870, London, 1980, p. 505, as Philips Wouwerman. Old Master Paintings: An illustrated summary catalogue, Rijksdienst Beeldende Kunst (The Netherlandish Office for the Fine Arts), The Hague, 1992, p. 324, no. 2882, illustrated, as Philips Wouwerman. B. Schumacher, Philips Wouwerman (1619-1668): the horse painter of the Golden Age, Doornspijk, 2006, p. 413, no. B47, plate 561, as copy after a doubtful painting by Philips Wouwerman. The Hague, Schilderkundig Genootschap Pulchri Studio, Catalogue de la Collection Goudstikker d'Amsterdam, 3 November-2 December 1923, no. 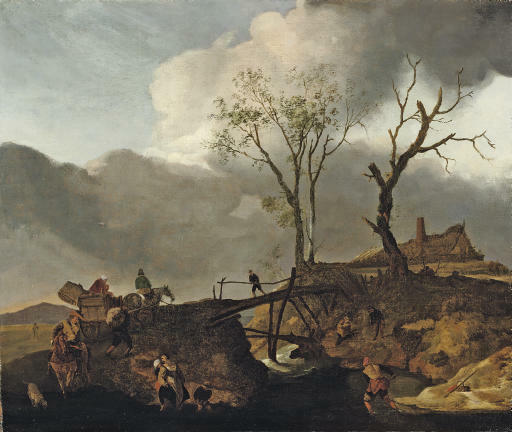 141, as Philips Wouwerman. Birgit Schumacher dates this painting to circa 1655. A similar composition by Philips Wouwerman was with Dorotheum, Vienna, 3 June 1996, lot 274.